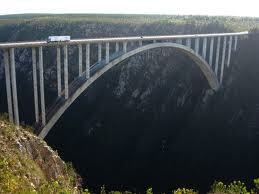 Bungee – The worlds highest bungee bridge at 216 metres. Bloukrans bridge is the largest single arch bridge in the southern hemisphere and now you can jump off it – bungy cord attached of coarse!!! There is a Restaurant / bar with a live video feed of the jumpers in action. It is one of themost professional operation with 100% safety recordand is run by a New Zealandbased company called Face Adrenalin. Photos and video of each jump are available fora momento as well as a certificate that you completed the jump as proof for those back home. Its in the Guiness Book of World Records, so if you have never jumped before, might as well do the highest jump there isand get it over and done with!!! They are situated about 1.5 hour drive from Jeffreys Bay towards Cape Town on the N2.